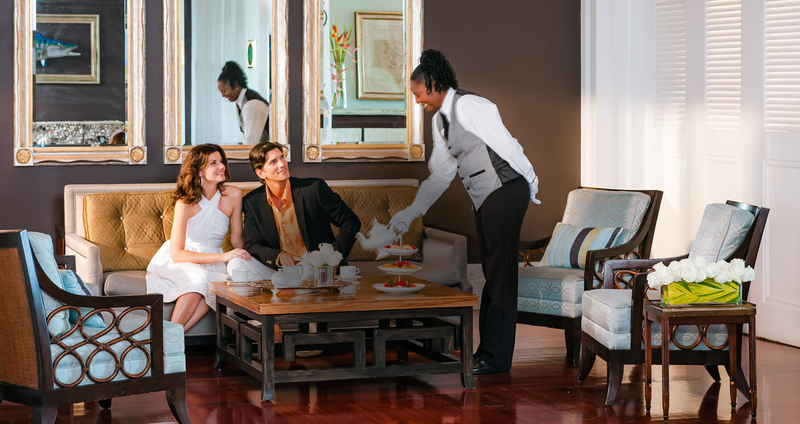 A place overflowing with extraordinary privileges, unique experiences, and exceptional service for concierge guests of Sandals Resorts. Extravagance is blended with remarkable amenities that completely redefine genuine hospitality and allow guests to enjoy one-on-one service and complete relaxation in the comfort of a stylish lounge. Club Sandals transforms the concierge experience into one that overflows with extraordinary privileges and exceptional service. Club Sandals concierge offers unique insider's opportunities exclusive to Club Sandals guests and the best recommendations for discovering all that Sandals has to offer...and beyond. In-Room Bar stocked daily with sodas, juices, water, Robert Mondavi Twin Oaks® wine, local beer and a variety of spirits. Hours: 24 hours lounge access; Staff will be available from the hours of 8:00 a.m. - 10:00 p.m. Tea and coffee station with assorted tea and freshly Ground Coffee (Jamaican Blue Mountain Blend Coffee). iPads displaying menus, martini menu, weekly activities and Managers wine list. Library of Local Books Available. Guest check-out with Club Sandals Concierge. Alcoholic Beverages, Sparkling Wine, Juice, Soda and Water. Coconut, Sugar and Chocolate cookies. Assorted Island Treats - Rumball, coconut drops, coconut macaroon. Guests staying at our Club Elite rooms at Sandals Montego Bay and Sandals Royal Caribbean also receive the exclusive indulgence of a BMW Private Luxury Transfer to and from the airport.